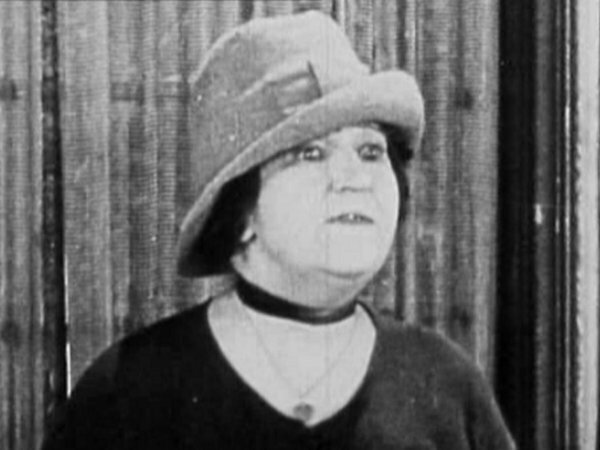 Hot-blooded Colonel Blood (James A. Marcus) is at home pacing the floor when the clumsy butler (William Courtright) climbs up on a chair to retrieve a large painting on the wall. He slips and the picture flies across the room and lands over the head of his master. 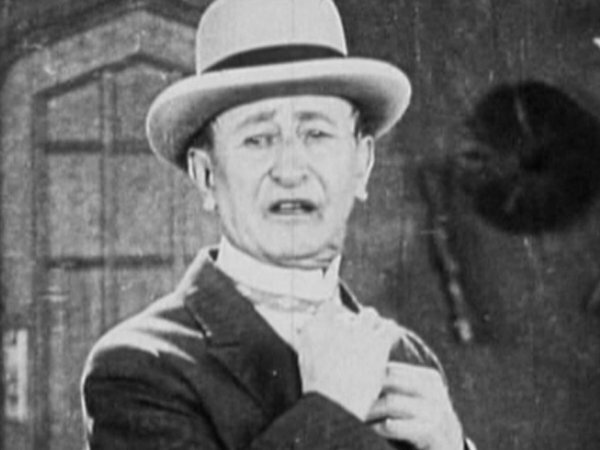 The enraged Colonel storms over to the butler and is about to kick him in the rear when the maid inadvertently gets in the way and takes the booting herself. She complains, the butler looks away in embarrassment and the Colonel bows to the maid apologetically. Two vagrants on a park bench are reading their respective newspapers. James Hives (Stan Laurel) reads the comic section whilst Marmaduke Maltravers (Oliver Hardy) is reading the news section. Hives bursts out laughing and gives a little shove to Maltravers, who in return gives Hives a look of disdain. Hives screws up his portion of the paper and throws it away as Maltravers taps him on the shoulder in admiration before returning to his own newspaper. Maltravers reads that due to the recent spread of forest fires in the area, five thousand men are needed to be recruited to tackle the problem. Off in the near distance Hives spots some forest rangers abruptly recruiting unwilling vagrants for duty. His fat friend plays nonchalant and lights a cigar as the ranger (Bob Kortman) approaches their bench. Hives nudges Maltravers to warn him of the ranger's presence but manages to burn him in the eye with the lit match. When Maltravers acknowledges the ranger he quickly makes an excuse to leave, stating to Hives that they have an appointment to meet Mr. Rockerfeller at the National Bank. The men slowly get up from the bench and walk away, and then begin running when they see the ranger is following them. They escape and find two bicycles conveniently by the side of the road, so of course they both jump on one of them, with Maltravers peddling and Hives sitting on the handlebars. The chasing rangers flag down a passing car and jump on, desperate to catch the fleeing couple. The due begin to climb a steep hill when the bicycle chain gives way and snaps. Then comes the next hill, down and with them trying to evade the pursuing rangers, they ditch the bike and run towards a big house. After jumping over a small hedge, they cheekily run into the home via an open door before closing it behind them as the rangers pull up in their car outside. Indoors, the butler and maid of the house are descending the stairs so Hives and Maltravers have to hide behind the curtains. They overhear the servants discussing that the house will be empty until Monday, which gives Maltravers the idea of free lodgings until then! When the servants leave Hives finds a small note tacked to the front door which confirms the house will be vacant over the weekend and that the house is being offered for renting. Meanwhile, the owner of the house, Colonel Blood is on a train when he pulls the emergency cord. The train comes to a screeching halt and throws the passengers into a messy heap - and all because he has forgotten to pack his bow and arrow. Back at the house, the two vagrants have made themselves very much at home, serving themselves a banquet dinner for two when the doorbell rings. 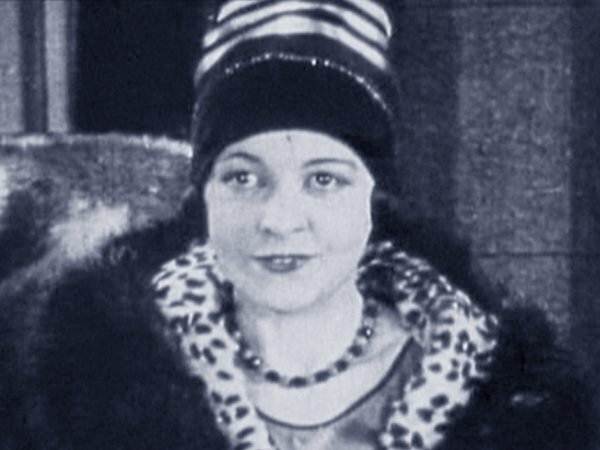 Believing it is the rangers, Hives hides as Maltraveres answers the door to find that it is in fact a wealthy young couple (William Austin and Madeline Hurlock). He overhears them talking about wanting to rent the house. Maltravers states that he will pose as the master of the house whilst Hives dresses up as the maid and adopt the name of 'Agnes'. Hives tries to put his foot down in protest but there is little he can do when he is forcibly frogmarched upstairs by his new master, who gives the clothes to his new maid (isn't it amazing how he knew exactly where to look, and in which room?) and is reminded that the rangers are still after them when they are observed from the upstairs window. Agnes answers the door to the couple before leading them inside where Maltravers, now dressed in Colonel Blood's clothing sits at the piano. Maltravers greets the couple, Lord and Lady Tarbotham, and they sit down on the sofa. Agnes brings his master a chair and he too is seated (at the second attempt). The gentleman guest asks if the Colonel has a billiards table? Maltravers confirms that he has and leads him off to find it whilst Agnes is invited to join the lady guest on the sofa. Upstairs, Maltravers is showing his guest around, still looking for that billiards room, when he is once again reminded by the ranger's presence lurking outside the window. He finally admits he cannot find the billiards room, but it is ok - Tarbotham doesn't play anyway! Mrs. Tarbotham starts asking Agnes the maid (Stan) about the house and how many rooms it has before asking to see the bathroom/bedroom* (*depending on which print you are watching). Stan takes the Lady upstairs and shows her the bedroom. Stan realises his stockings have come undone and when Lady Tarbotham isn't looking he quickly adjusts his leg just as Ollie walks in with the husband. Tarbotham likes what he sees and asks for immediate possession of the house and ask that Agnes, whom the Lady has taken a shine to, can stay on as the maid. Colonel Blood is on his way home and Ollie is packing pretty much the entire house into his suitcase - to the shock of Lord Tarbotham, who is even asked to jump on the case to try and close it shut! The Colonel arrives on the doorstep but is told by 'Agnes' that the house has already been rented. He shoves Stan aside just in time to witness Ollie snapping his beloved bow and arrow so as to fit it into one of the many trunks he is packing with the Colonel's belongings. Stan sees that the Colonel is about to blow his stack and quickly shoves him in a nearby closet. Ollie explains to the would-be tenants that the man is deranged before the Colonel breaks free and is confronted by Lord Tarbotham. A chase around the house with the Colonel firing his gun aimlessly, even at the removal man who has turned up, ends when Stan's cover is blown by his maid's uniform being ripped on a nail. 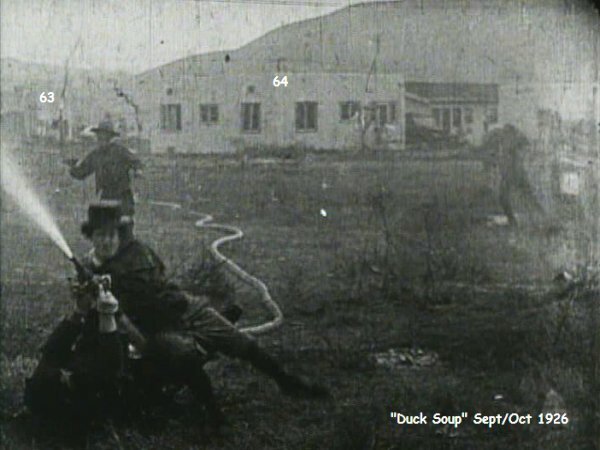 The forest rangers have tracked Stan and Ollie down to the house and press them into fire fighting duty. The film ends with the boys clinging on for dear life at the out-of-control water hose which is flying around in the air. 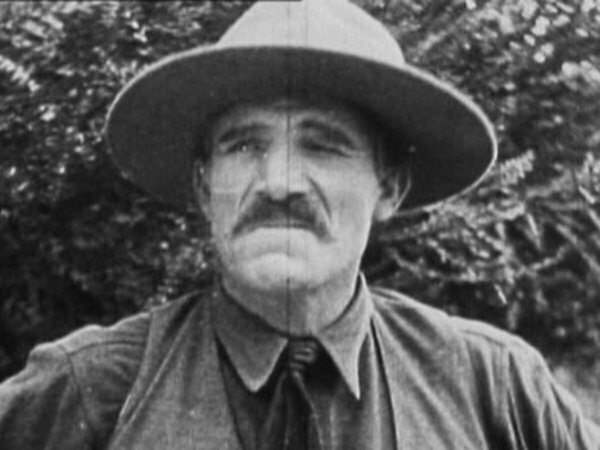 Colonel Blood is an ill-tempered man. Locking him in his own closet is not advisible. But Stan, dressed as the housemaid Agnes does it, much to his regret. The Colonel kicks the door from the inside so hard that his boot connects with Stan and sends him flying across the room - straight into the arms of Hardy. • Remade in 1930 as Another Fine Mess. • Copyrighted January 13, 1927. • Based on a sketch 'Home From The Honeymoon' written in 1908 by Stan's father Arthur J. Jefferson, Stan wrote the screenplay to the film. It was 19 pages long and left little room for improvisation. • The scene where Bob Kortman posing as the ranger trying to recruit the unwilling public into joining up for service was later re-used in Pack Up Your Troubles in a memorable scene with co-star Tom Kennedy. • The film was considered lost until 1974. • There are 42 intitertitle cards in the film. There are 2 extra in the prints containing the bathroom scene. In addition to this, there are 2 more cards in the revised Michael Agee print, making a total of 46. 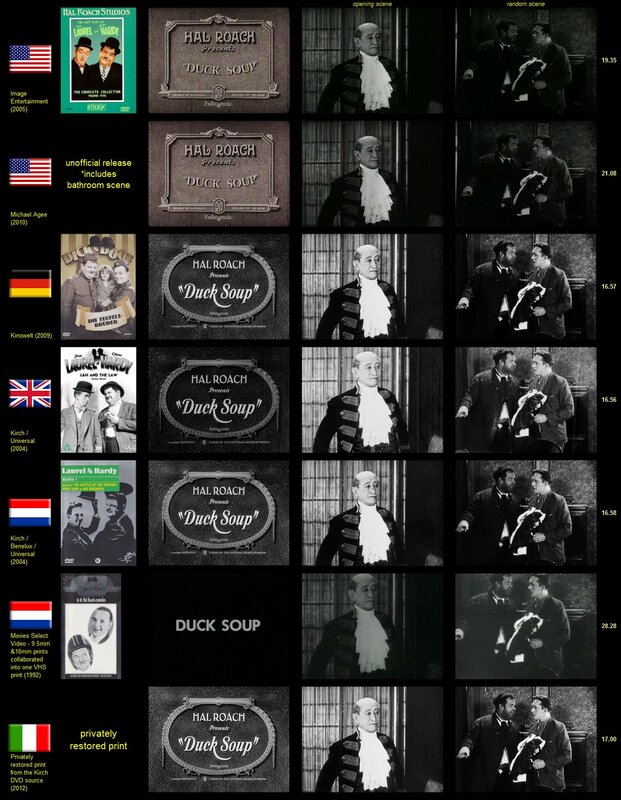 In the image showing all the title cards, I have lined them up in continuity. There are blacked-out spaces in the sections where additional cards are placed in the other prints. There are seven soldiers depicted in the painting which Colonel Blood ends up wearing. 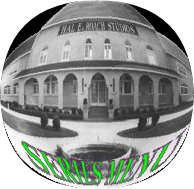 • When we first see Stan and Ollie sitting on the bench, Stan is wearing a bowler hat and Ollie a top hat. • There is a lake to the left of the bench. This can be seen when the camera is on the side shot of the boys as the ranger comes over to them when Ollie lights his cigar. • In the Kirch print, Ollie refers to Stan as "Hives", but in the Lost DVD print he calls him "Stanley". 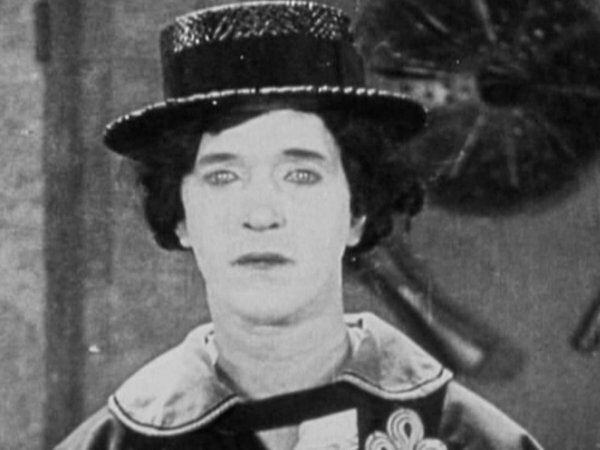 In the original script Stan Laurel's character was called "James Hives". 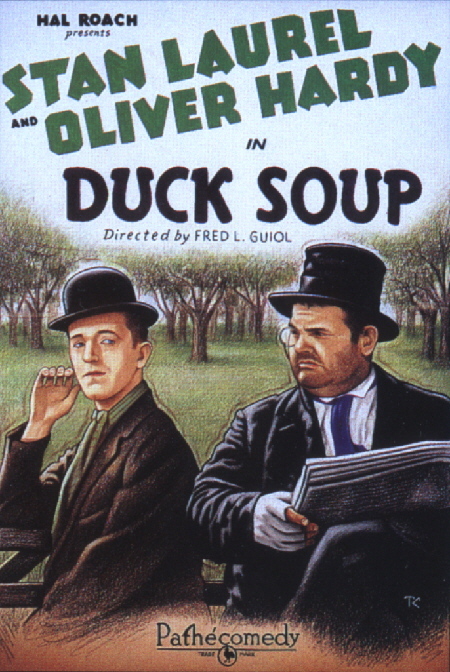 • There is a water hose spraying the grass in the background behind the park bench where Stan and Ollie are sitting. • When Stan and Ollie take to the bicycle which is parked at the side of the road, there is a railroad crossing in the background. • Depending on which print of the film you see, Stan confesses it is his first time on a bicycle and then calls Ollie "sir" which would indicate the two men are not friends but rather, strangers. We simply see them as friends because they are sitting together on the park bench at the beginning. • Just as Stan and Ollie ride their bicycle to the bottom of the hill the Key West Hotel can be seen on the right of the screen (behind the two buses that park in the center of the road). • By the time the boys dismount the bicycle, if you look carefully you can see that the back wheel is completely wrecked! • The Colonel lives at number 2505. The number on the front of the train he is travelling on is 1574. • When Ollie reads the note tacked to the front door he clearly mouths the name "Hives" to Stan. Yet the title cards on some prints completely ignore this. • In the intertitle cards, the Kirch print refers to the newlyweds as the Tarbotham's and the Lost DVD print refers to them as the Plumtree's. • When the newleyweds ring the doorbell, as they wait outside, Ollie comes to the door and looks through the hatch. It is on the extreme left of the frame and almost missable, but you can just see his head. 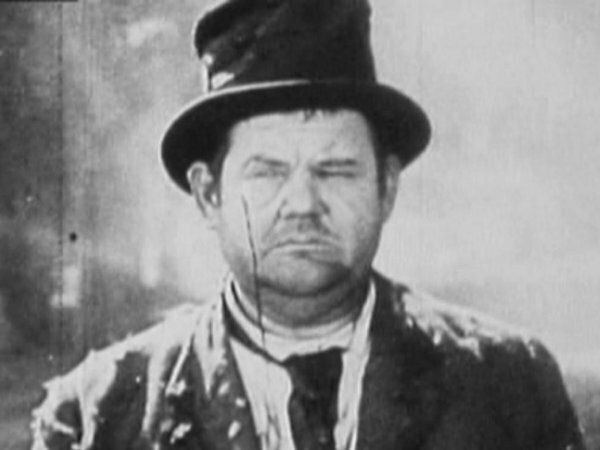 • When Ollie catches Stan after the Colonel has kicked him flying across the hallway there are no cuts in the film when Stan lands in Ollie's arms. That is a good show of strength there from Hardy. • "Both are similar in sharpness, but Lost seems a bit dark and murky to me; Kirch is a lot brighter. However, the Kirch copy as used on the UK Universal set has a strange semi-transparent "fold" pattern at the edge of the screen (found on some other shorts in this set too, but not present on e.g. 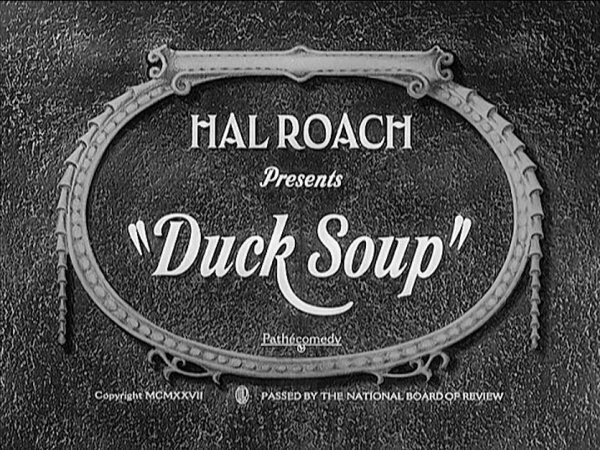 the Kino version of this film). I don't want to mention the authenticity of gag cards in general, but the remade newspaper article in the Lost copy is hideous! 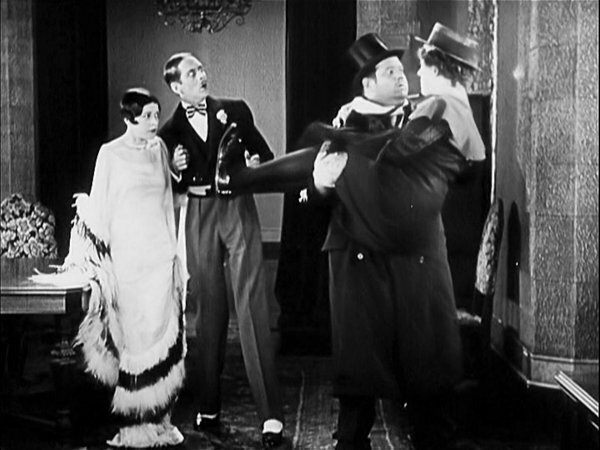 Both Kirch and Lost's versions derive from a 35mm print, but a 9.5mm print also survives and contains 5 sequences which are unavailable on DVD: 1) Medium-shot of L&H on bench (a few frames only); 2) Stan (as Agnes) and couple at door (2-3 secs); 3) Ollie showing husband around (38 seconds); 4) "Agnes" panicking at having to run wife a bath (1 min 25 secs); 5) Altercation between the Colonel and his tenant (10 secs). 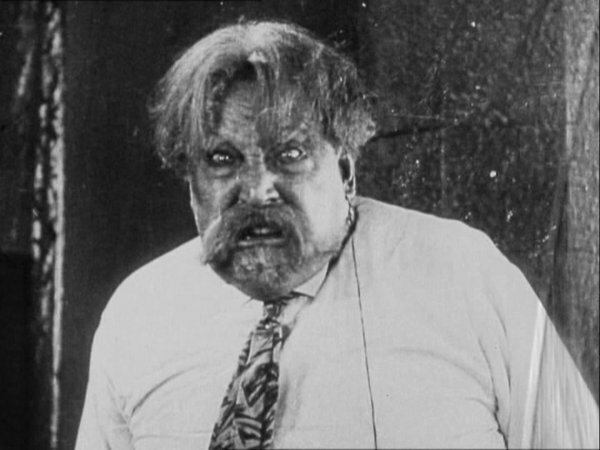 The bathroom scene (only) was intact on the short-lived/unofficial 2010 Michael Agee reissue of the silents – the only DVD release of any of this extra material to date. •The 28 minutes running time on the French/Dutch titled print is not so much due to extra footage but moreso because the film runs at a much slower speed. If you take the Universal/Kirch print as reference: @ 12 mins 11 secs - upstairs after Ollie has agreed for 'Agnes' to stay on with the newlywed couple, Hardy and Lord Tarbotham leave the room..... then it cuts to Colonel Blood in the cab. This is where the extra footage comes in. It is 18 mins 45 secs into the print. After Hardy and Tarbotham leave the room, the scene continues with Lady Tarbotham walking over to Agnes and closing the door, keeping them both in the bedroom. She then asks for Agnes to run her a bath, which is next to the bedroom, and is the reason she has closed the door to keep the men outside. Stan goes into the bathroom and closes the door behind him, adjusts his stockings then turns the taps on to start the bath, getting himself in a fluster during the process as the steam from the hot water engulfs the small room. Stan comes running into the bedroom where Lady Tarbotham is in a state of undress, sees her then runs back into the bathroom and slips over. He closes the door and panics. When he looks through the keyhole and sees the woman walking towards the bathroom he tries to jump into the sink to hide(!) Instead he bends over the bath and puts his head into the water. The Lady comes in, sees him and smacks his backside. She does eventually pull him out of the water and they stand side by side as Stan takes a good look at her chest (I mean, who wouldn't, it is Madeline Hurlock after all!) Stan plays embarrassed, but the Lady looks on without emotion (or even moving!) As he tries to explain the situation he slips and falls completely into the water-filled bath. We then see a car coming down the street towards us, followed by a close-up of Colonel Blood - this is where the Universal/Kirch print kicks back in. The extra footage ends at 20 mins 47 secs, so that is a total of 2 minutes and 2 seconds of footage - but the print is very much slowed down, so it is probably about 1 minute 45 seconds in "real" time. 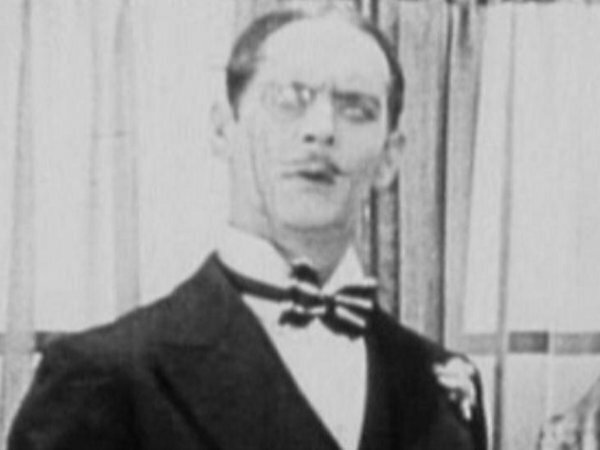 The extra footage is screencapped below in a section which is incorporated into the main feature to preserve continuity. 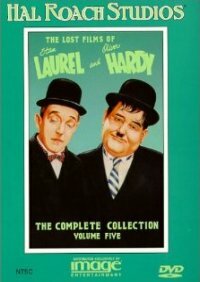 • "The first film in which Stan Laurel and Oliver Hardy appeared together for Hal Roach is a mediocre outing memorable for the one scene which is missing from most prints!" ~ Lord Heath.